The nbnTM is a brand new telecommunications network currently being rolled out across Australia. It will prepare your home or business for the future with a fast and reliable phone and internet service. 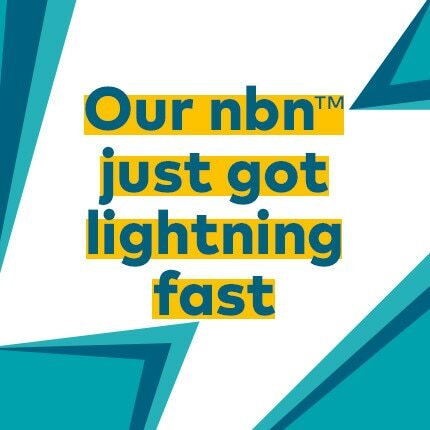 We’re here to help you make the switch from your existing broadband connection to a suitable nbn plan as soon as possible. Start your nbn journey today. WHAT DOES NBNTM STAND FOR? NBN, or National Broadband Network, is Australia’s purpose built, high capacity broadband network. By utilising a range of technologies, across an Australia wide network Optus NBN is able to connect your home to Australia’s newest high capacity broadband network. Providing you with a better online experience. Joining Optus NBN is easy. Just check online that your home is nbn ready and select the Optus plan that best suits your needs. Want to know more about the NBN rollout and how to get connected to NBN? Get more done at home. With an nbn speed pack, busy households can connect lots of devices all at the one time. Consume seamless entertainment. Get quick access to your favourite content including music, movies and video clips. We offer great nbn options for homes and businesses. See our broadband plans, offers and exclusive entertainment inclusions. Use the checker below to see if nbn is available at your address or view our rollout coverage map. Browse our range of nbn plans and bundles for your home or business and purchase the option that suits your needs. Start preparing for your nbn installation day. We’ll help to make this as easy as possible. A fibre cable connects the nbn network directly to your premises. A fibre cable connects the nbn network to a nearby node, then existing copper wires connect your premises for the final stage. A fibre cable connects the nbn network to your building, then existing copper wires connect your apartment for the final stage. A fibre cable connects the nbn network to a nearby node, then existing cable TV wires connect your premises for the final stage. A fibre cable connects the nbn network to a transmission tower, then a rooftop antenna connects your premises for the final stage. A fibre cable runs to the curb near your home, then existing copper wires connect to your premises for the final stage. Important Information for Cable and Optus NBN Customers: Equipment supplied requires mains power, which may not be suitable if you have a serious illness or condition, require disability services, have a back-to-base alarm, or require an uninterrupted telephone line. Call us to discuss your options. Serviceability: NBN is available in selected areas. Unfortunately we cannot guarantee installation until we successfully install your service. NBN fixed line Speed: Internet speeds indicated are maximum theoretical speeds only. This doesn't mean that you will experience the maximum speeds at all times, in fact you will typically experience slower speeds due to a number of factors including demand on the Network and local conditions such as internet traffic, your line condition, your hardware and software, the data source or destination and your location that prevent or interfere with reception and speed. NBN fixed wireless Speed: Internet speeds indicated are maximum theoretical speeds. You will not experience these speeds at all times - you will typically experience slower speeds due to a number of factors including: demand on the network; local conditions such as internet traffic; obstruction of the antenna’s line of sight to the tower; your hardware and software; in-home set up; the data source or destination, and your location, that prevents or interferes with reception/speed; and weather conditions such as extreme heat and heavy rain. Typical evening speeds (7pm – 11pm) will be lower than off-peak speeds.